Article: What do you do with 99% campus graduates who you don’t hire? 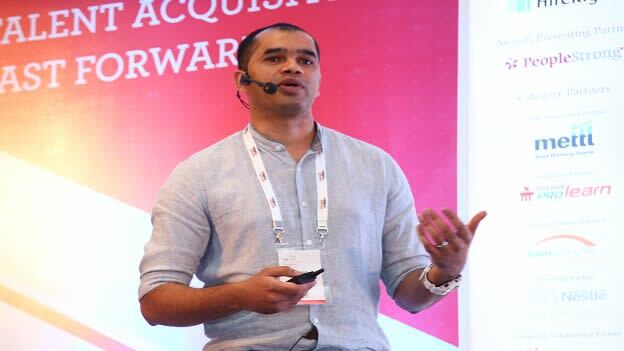 At the People Matters Talent Acquisition Conference, Suhail AH, Talent and Outreach programs lead-India, Google shared insights on hiring campus recruits and the innovative practices followed to engage potential hires. 'Millennials' a word which is being heard a lot more since the technological advances and fast progressing data management systems. However, many factors are yet to be improved and reviewed with regards to retaining and making them a part of organizations. Youth is considered as the future, yet only 1-2% of total candidates who apply on-campus recruitment get hired by organizations. Is there a disconnect in the process? Are we following the correct methods to employ new bees? What is the right practice to be followed while hiring campus recruits? At the People Matters Talent Acquisition Conference, Suhail AH, Talent and Outreach programs lead-India, Google helped us understand how they overcame this obstacle and the innovative practices followed to engage potential hires. Student's first: It is vital to understand what the expectations of the students from the internship are and what can your organization provide. Connect early: Building a healthy relationship gives you a better understanding of the recruit’s skills, talents and possible development areas. Dependency on interviewing methods: Being students and inexperienced with regards to work culture or interviewing process it can be difficult to judge their readiness to adapt to your organization's culture or work ethics. There is a high possibility of losing great talent if you decide the capabilities of any recruit depending on their interviews. Expand your reach: Try and expand your search for talent. Do not keep your horizon limited to a particular field, region or colleges. Measuring the effectiveness of your programs: Programs and orientations play a significant role in attracting new talents. It is essential to ensure that your companies requirement and facilities are well communicated to the interns. Measuring the impact of your developmental programs is equally important to understand if they give you the right candidate. Don't rely on applications: It is important to connect on all platforms that help you acquire talent rather than being dependent on applications. Keep an open mind and understand if there is any particular field that does not give you any or little output and try and understand why and how you can improve the statistics. Suhail states "We were following a narrow and outdated method of campus recruitment, and while analyzing the methods we realized we lost many potential employees." It can be quite challenging to have trained professionals forget their past skills and adapt to new methods and culture of working. Campus recruits can be a safe bet when it comes to hiring as they are fresh and have a clean slate that can be taught and molded into perfect employee. "The primary reason why we lost many graduate recruits is that only a few employees would go to campus interact for few hours and choose some applicant who they thought were radiant and had the enthusiasm to work with Google," says Suhail. Most companies follow the same method and tend to lose opportunities to create better professionals. Google adapted new techniques to improve the hiring process and recruit more graduate freshers by connecting with students as early as their first year of college. "By touch basing in the initial stages, you get details about what the intern is doing in their free time or to improve their knowledge and skills. There are a few aspects that even a resume or interviewer might not be able to touch base with." With this new and innovative method, they were able to improve their hiring rates by almost 30-40% in the initial stages. Suhail believes that being in constant touch and developing the empathic relation with the campus recruit built a healthy relationship. He states, “Not all recruits converted into full-time employees, but it built a great sense of respect, and the door for future endeavors have been opened." Organizations need to come with new ideas and techniques to attract talent as there is enormous competition for gaining better talent. There are better chances of hiring outcomes and having a vast and diverse workforce which will not only enhance the culture but produce better results. Possibilities of connecting and inspiring increases when you take initiatives to connect with young enthusiasts giving you better access and increasing your chances of retaining young and vibrant talent. Organizations investing time in developing these blooming buds have more chances of success as they have ideas and approach obstacles in a fresh and unique style.